LOOKING SHARP: Toyota's new Prius hybrid has arrived with improved driving dynamics, plenty of included kit, and rather polarising styling. POWER sliding sideways across gravel isn't your expectant vision of a Toyota Prius. Yet that's what the Japanese carmaker said is now within the capability of its tree-hugging hatchback. Oh, it's still green. Sipping on average just 3.4 litres for every 100km travelled - the greatest efficiency gained since the 18-year- old, four-generation nameplate was launched. 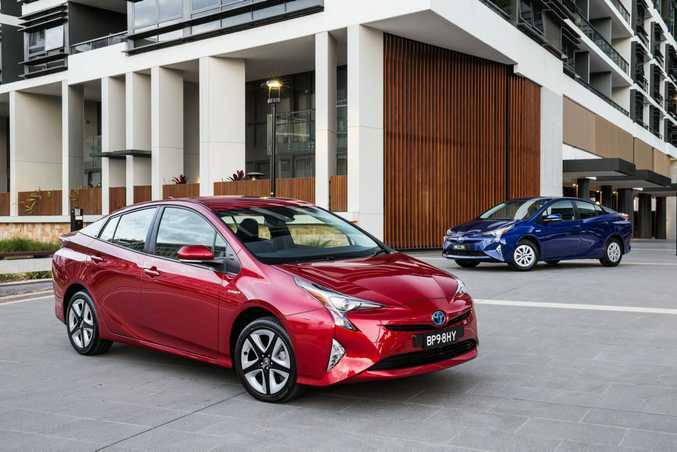 Completely revised from the ground up, the new Prius wears a striking new look, more efficient drivetrain and a heap of new technology - albeit the base price has risen $2500 to $34,990, whereby the top-spec i-Tech has dropped $1000 to $42,990. Refreshingly different, the cabin is almost un-Toyota. Apart from the familiar digital clock, the Prius wears some slick smartphone-like glossy finishes through the console, 10.6cm touch-screen display and a central information binnacle. 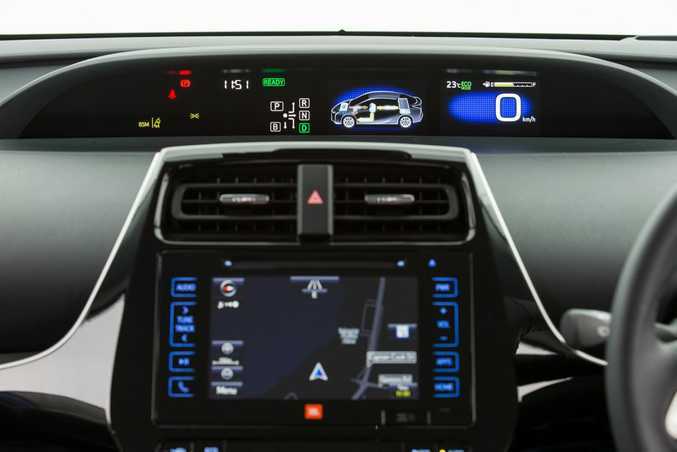 The driver has a head-up display that projects data on to the windscreen, which offers information such as a digital speedo, and a cool three-spoke steering wheel. Compared to the previous model, the driver has a 55mm lower hip point with a reduced steering angle, and together with better bolstering in the seats it's a more comfortable position. Vision has also been improved via a lower bonnet. Tall passengers will appreciate the increase in 20mm body height, while the high point of the roof has been moved 170mm forward. 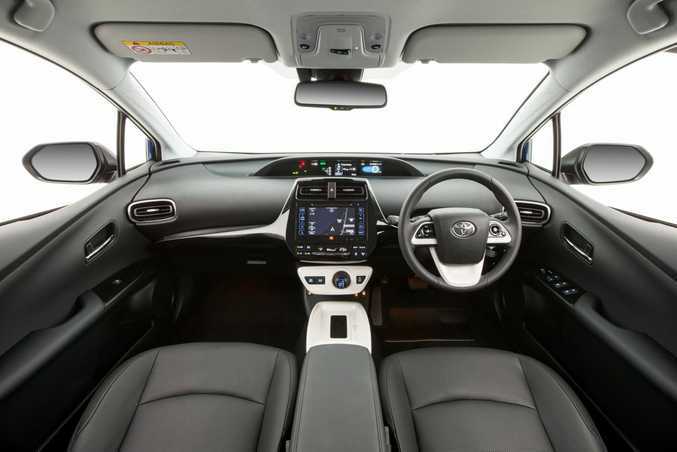 Front and rear space offers four adults comfortable surrounds, three across the bench seat can be done but three burly blokes would be a stretch. Feeling far more rigid with less body roll, the Prius is also noticeably quieter in the drivetrain. The new global platform, the architecture used for many upcoming Toyota and Lexus models, features more torsional rigidity than its predecessor (up 60% with 31% more spot welds). While it's a familiar 1.8-litre petrol engine, Toyota has worked on all aspects to deliver a faster engine warm up, better combustion with less friction and it uses electric power more often. That means a better return for every drop of fuel. The petrol engine and electric motor combined generate 90 kilowatts - 10 less than the previous combination. Actually heavier and slightly slower in a sprint than the outgoing model, the big improvements come in driving dynamics. Slinging a Prius into bends at speed is not something you traditionally do, but we had some fun testing its newfound ability. Falling short of sporty characteristics, it still handles changes in direction well and offers far more responsive performance. 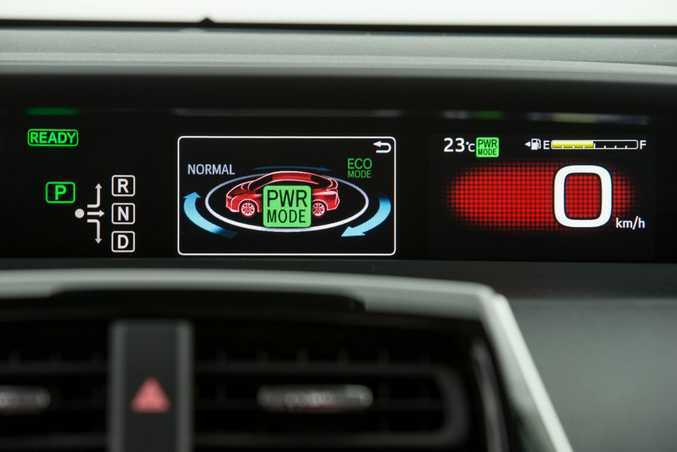 Various drive modes are available via the push of a console button, including the likes of Eco, Normal and Power for spirited driving. Toyota launched the 2016 model Prius this week. Toyota has thrown some impressive kit at the Prius, with standard fare including 15-inch alloys, radar cruise control, lane departure warning, automatic high beam headlights, colour head-up display, twin colour 10.6cm displays, auto-levelling bi-LED headlamps, LED daytime running lamps, 10-speaker JBL audio system, ToyotaLink which partners to your smartphone to help find locations or fuel and even the weather, three-spoke leather-accented steering wheel, a wireless charger for Qi enabled phones, along with radar cruise control. 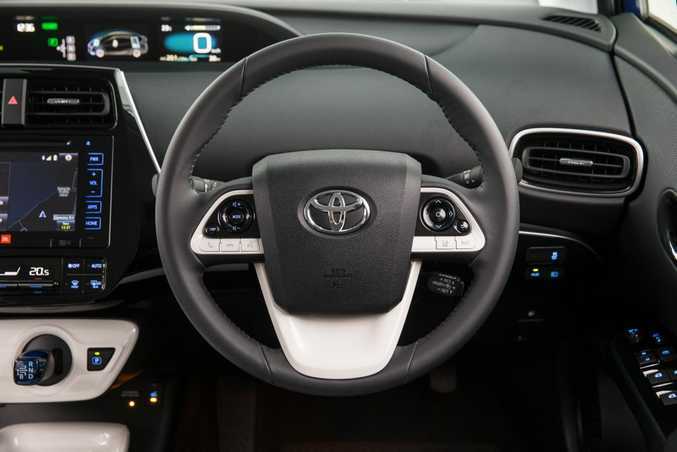 Prius i-Tech is also fitted with 17-inch alloys with resin inserts that reduce weight, rear cross traffic alert, digital radio, blind spot monitor, satellite navigation and leather- accented seats with eight-way power adjustment for the driver's seat and front-seat heaters. Around town the Prius was close to its official fuel consumption figure of 3.4 litres for every 100km. Out on the highway it rose to about four, still a super thrifty operation. Toyota has an enviable reputation for reliability, you only need look at a taxi rank to see how drivers have embraced the Prius. 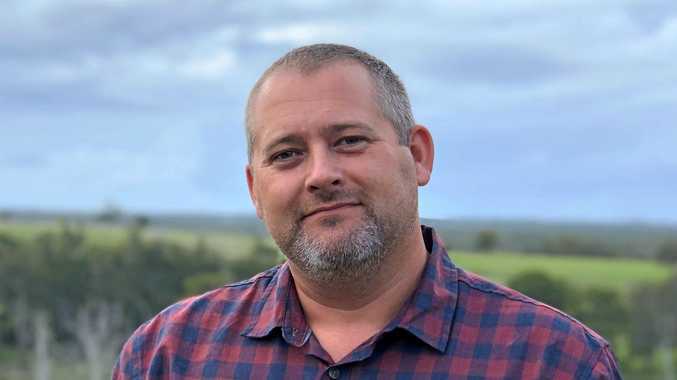 Executive director of sales and marketing Tony Cramb said there was no concern regarding inflated parts prices with this new model, and also emphasised the capped price servicing cost of $140 for the first six maintenance trips to the dealer. 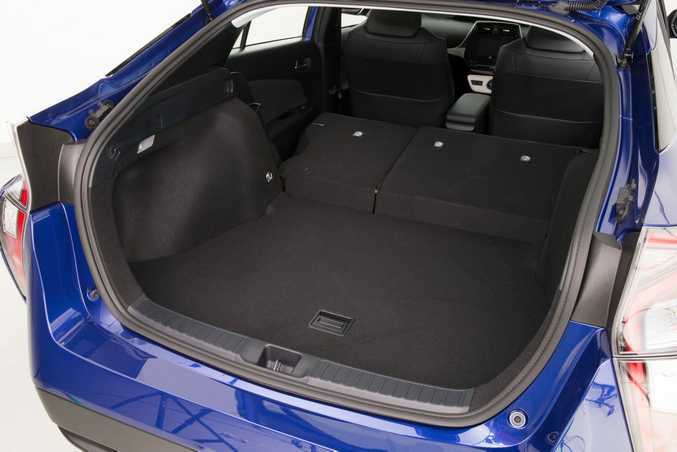 Boot space is about 500 litres courtesy of a more compact battery being moved beneath the rear seat. That enables the rear seat backs to fold 60-40 for a flat load space. It is still a high floor position in the boot, but good enough for a couple of suitcases. Each door has a bottle holder, and the centre console has two cup holders along with auxiliary and USB ports. A deep console bin provides a good storage option. 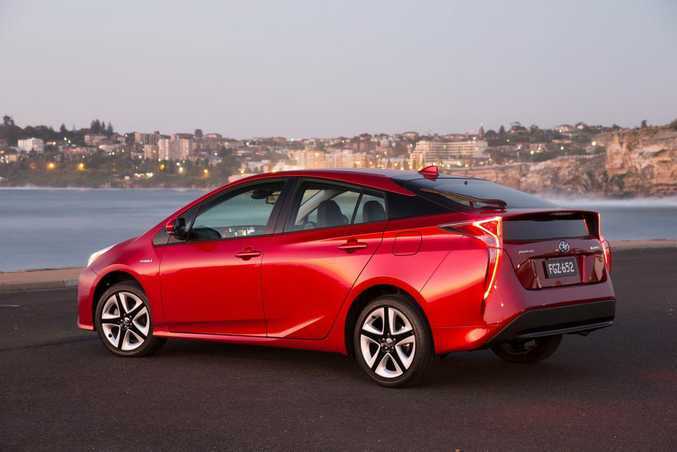 Always distinctive, this new Prius is futuristic and sharp. It's certainly edgy, and won't suit all tastes. The rear end is particularly interesting, with the Honda-like dual window pane and LED lighting configuration. One thing's for sure, the shape's slippery in terms of aerodynamics. It's the only car we've seen with hubcaps on top of the alloys to improve airflow (on the base model), and it has a coefficient drag figure of 0.24... not so long ago anything around 0.30 was impressive. 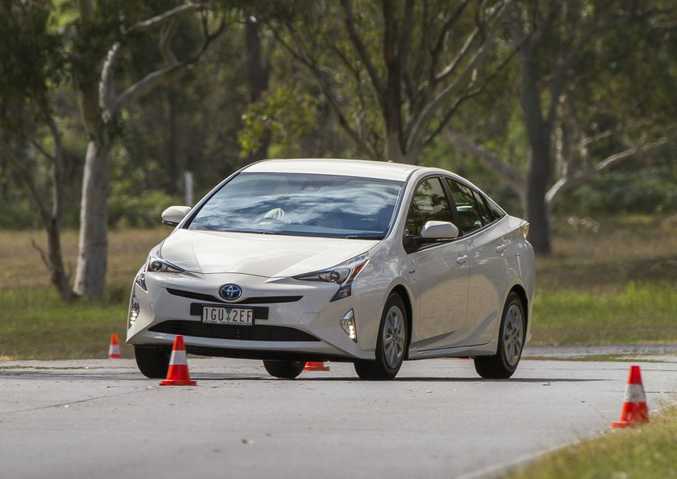 Toyota has certainly been at the forefront of Australia's acceptance of hybrid vehicles. 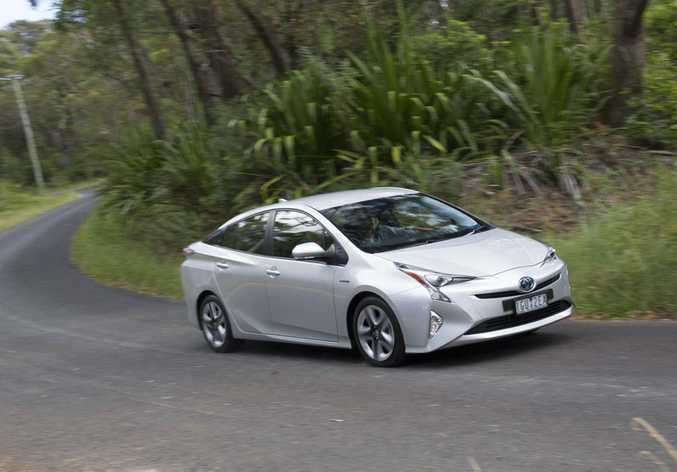 Camry has become the nation's biggest hybrid seller, but more than 20,000 Prius models have found homes Down Under. 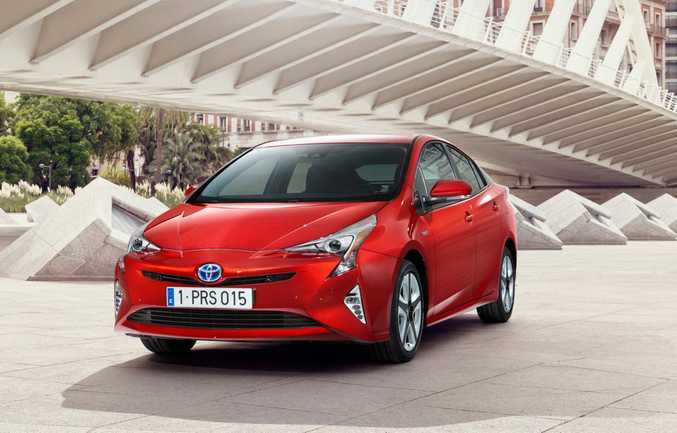 Part of the original appeal was the quirky styling which highlighted the Prius's green credentials. Soon there will be a hybrid Corolla and it will be interesting to see if buyers are keen to get the technology without the distinctive looks. 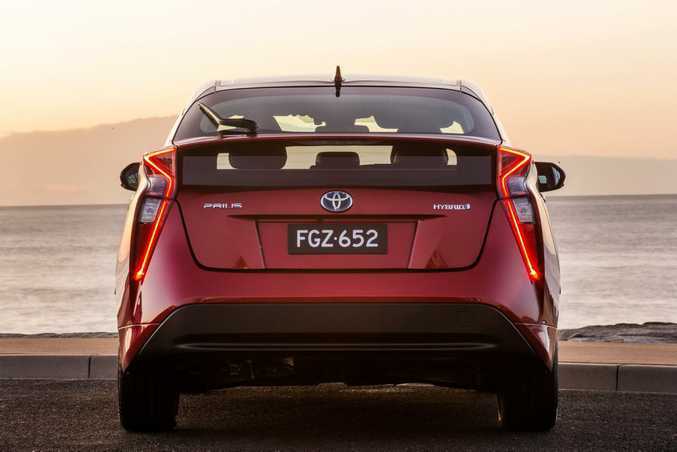 The Prius remains a brilliantly economical and environmentally friendly offering - and this variant is better in nearly every facet. It may not be a sports car, but it remains a leader in the green game. 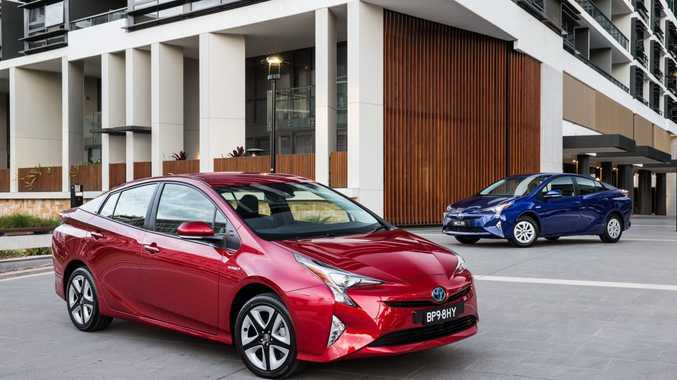 HYBRID LOOKS: Will the polarising style of the Prius model mean it will lose sales to Toyota's own Corolla Hybrid model when it arrives later this year? What we liked: Cabin materials, improved cornering ability, impressive standard features list, Apple Carplay and Android equivalent. What we'd like to see: Less busy exterior design, cleaner styling of information binnacle, foam boot insert removed for extra boot space. Warranty and servicing: Three year/100,000km warranty, with eight year/160,000km battery warranty. Capped price service of $140 for the first three years or 60,000km (up to six services). Servicing schedule is six months/10,000km. Details: Five-seat front-wheel drive compact hybrid hatchback. Engine: 1.8-litre four-cylinder generating maximum power of 72kW @ 5200rpm and peak torque of 142Nm @ 3600rpm, electric motor maximum output of 53kW with Nickel-metal hydride battery for combined output of 90kW. Consumption: 3.4 litres/100km (combined average). Bottom line plus on-roads: $34,990, i-Tech $42,990.